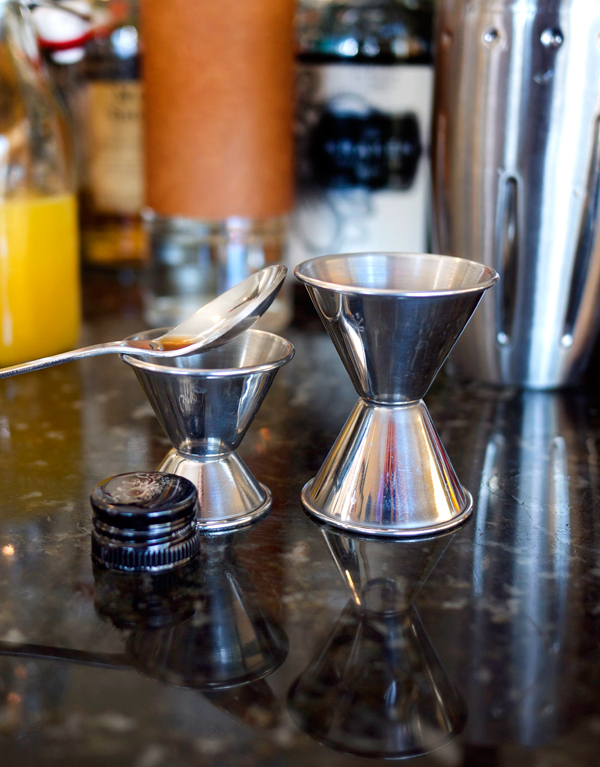 Making cocktails does not solely get delegated to me at home. My husband enjoys them as much as myself, and sometimes even gets his hands dirty and tries to concoct one on his own. Sometimes they’re even good. This cocktail stems from a creation at least 60% his, with some of my own adjustments. Its creation from a new found love of Allspice Dram; a love so strong I found him drinking the stuff neat once. The syrupy flavors of cinnamon, nutmeg and clove are a bit too powerful for my palate on their own but he couldn’t stop throwing it into drinks once he got his hands on it. I can’t knock him though, I’m doing the same thing with that Apricot Liqueur. I was going to even have him name this cocktail until all this talk about spices led to absurd quotes from Dune. I know of Dune, but my only vivid memory of the film is in the form of View-Master slides I received for my preschool graduation that erupted a timid 4 year old into screams of horror and probably a fitful sleep that night. Popples and a Dune View-Master… Mom and Dad… what were you guys thinking? No, for this drink I wanted it to be ALL Tiki. Allspice Dram, also referred to as Pimento Liqueur or Pimento Dram, is dotted here and there within Tiki cocktail books. With the combination of the rum and citrus in this cocktail, clearly this drink was headed tropical, and not deserts inhabited with giant worms. We were also having a string of 80° days in Los Angeles and this was a good thirst quencher. Combine all ingredients except orange peel and cherry with 6 oz. of crushed ice. 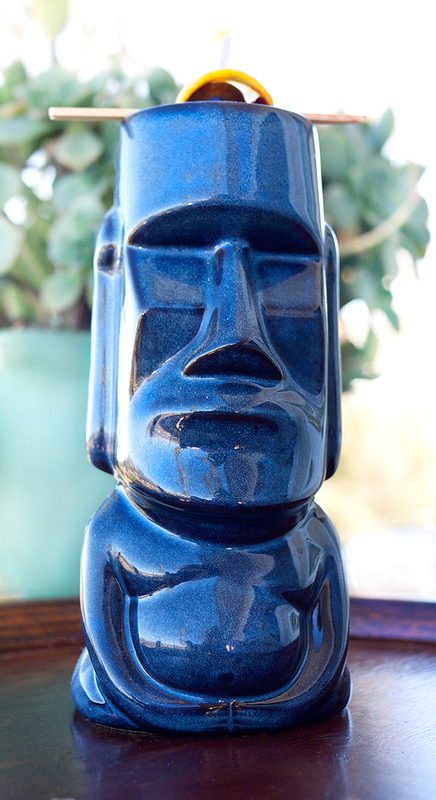 Shake well and pour un-strained into a Tiki mug. Add more crushed ice to fill if necessary. 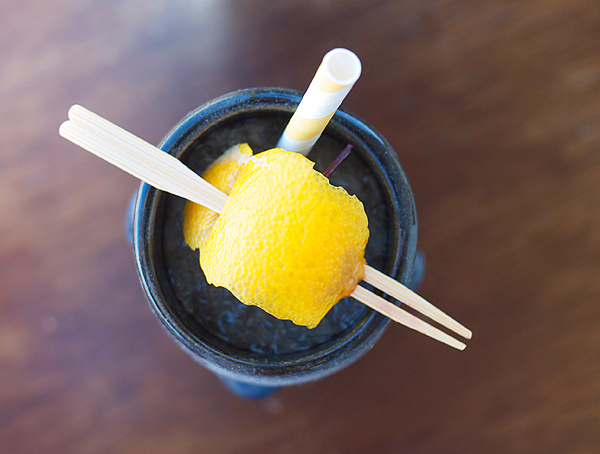 Garnish with the orange peel looped over the cherry on a bamboo pick. Straw optional but recommended. At first one might be shocked that with all the talk about the Allspice Dram there is only an 1/8 of an ounce here. Believe me… that is all you will need. It’s quite powerful stuff and a little goes a long way. If your orange juice is not very sweet, ours was, you can turn down the lime juice and orange bitters. Those two ingredients were added for more bite and tartness to counteract the overly sweet OJ. The Allspice Dram unites the drink in a satisfying way. Without it (and I know this because I forgot to add it on one try) the fruit flavors are segregated from the spice of the rum in a jarring way. Adding it is like a sweet bridge between those two worlds of flavor.